Images from Create A Kappa month, made by members of Creators on Twitch. For a list of the artists, please visit the ‘Create A Kappa‘ community project. I was studying Josh DeSeno’s face while he tried to explain what makes it so important. I certainly wasn’t able to tell by looking at him . He has large, close-set eyes, thin lips, and dimples on his cheeks. As we talked over video chat, DeSeno wasn’t making much eye contact; he was talking to his keyboard more than to me. “I’ve gotten used to people constantly using my face,” he told me. I looked at that face — that unremarkable white-guy face — and wondered: Outside of the queen and the other famous people on currency, how did DeSeno’s face become perhaps the most reproduced one in human history? How Josh DeSeno became the face of impish sarcasm is at once simple to explain and complicated to understand. The origin story is pretty straightforward. In 2009, DeSeno was hired as an early engineering employee of Justin.tv, one of the first livestreaming video sites on the web. His first task was to rewrite the chat client for the gaming channel that would become Twitch, one of the many new community-based products Justin.tv was rolling out. Since many of the original Justin.tv staffers had inserted their faces as emoji easter eggs for the chat room,2 DeSeno decided to do the same, using the photo from his employee ID. Josh DeSeno’s Justin.TV employee ID photo in 2009. About six months after it was discovered, though, DeSeno noticed Kappa start to take on its modern connotation. Maybe it’s because Twitchers started to understand the origins of the Kappa name. Or maybe it’s because, in that famous photo, DeSeno has a subtle smirk on his face — or “just a feigned smile,” as he describes it. DeSeno prefers a different explanation: “Kappa” happens to be easier to type than all the other emote words, like “OptimizePrime.”3 Ease of typing is useful for when you’re filling up the chat screen with trolling emotes after you blow up all the other members of your raiding party with a poorly thrown bomb . In the six years since he created the Kappa emote, DeSeno has left the company to help start a virtual reality testing firm and Twitch was acquired by Amazon for about $1 billion. But Kappa has kept rolling. “It’s been something that I’ve expected to die off after a while,” DeSeno said. “You don’t see people talking about ‘Chocolate Rain,’ but the Kappa meme has been really long-lived.” One of the reasons is the growth of eSports, which have attracted huge audiences who want to see professional teams compete in video games including “Counter-Strike” and “Dota 2.” In a story for ESPN The Magazine’s special issue on eSports earlier this year, FiveThirtyEight’s Ben Casselman pointed out that 27 million people tuned in to watch the “League of Legends” championship online. Like fans at other sporting events, gamer fans love talking smack. It’s not uncommon to see a giant Kappa head waving in the stands at these events. While DeSeno remembers the corporate Twitch folks initially resisting the impulse to capitalize on Kappa, they — like DeSeno himself — have realized the emote isn’t going anywhere. At the first dedicated Twitch conference, a 20,000-person gathering that took place in San Francisco last month, all the attendees were issued Kappa-branded lanyards, and the education zone — where Twitch broadcasters learned how to make more money off their streams — featured a huge backdrop of Kappa in glasses. “We celebrated Kappa at TwitchCon simply because it has become so central to the way we all communicate on Twitch,” said Matthew DiPietro, Twitch’s vice president of marketing. Josh DeSeno on stage at TwitchCon 2015 in San Francisco on Sept. 25. 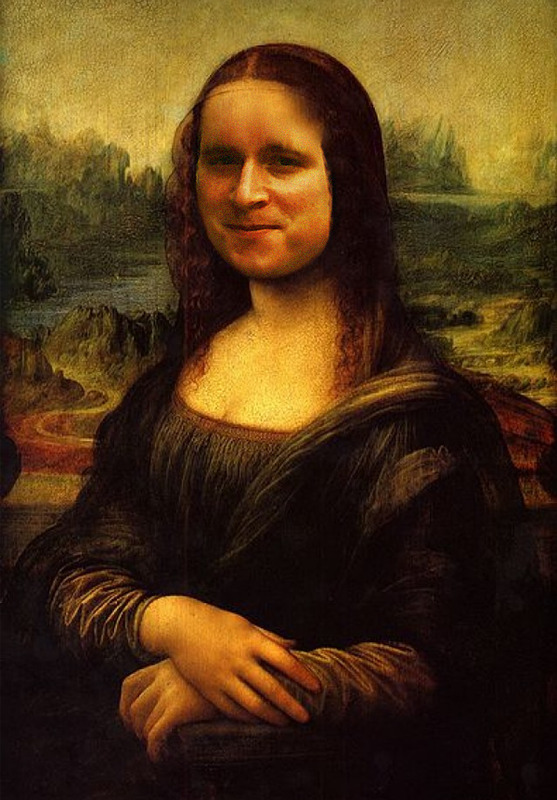 ”KappaPride” — introduced on June 26 — and “Keepo” are takeoffs on Kappa that are based on the same image of DeSeno’s face. Add the number of times those two are used each minute to Kappa’s rate and DeSeno’s face is appearing 913 times per minute. TwitchEmotes.com has data going back only to Jan. 16, and is missing data for some days in May and July. 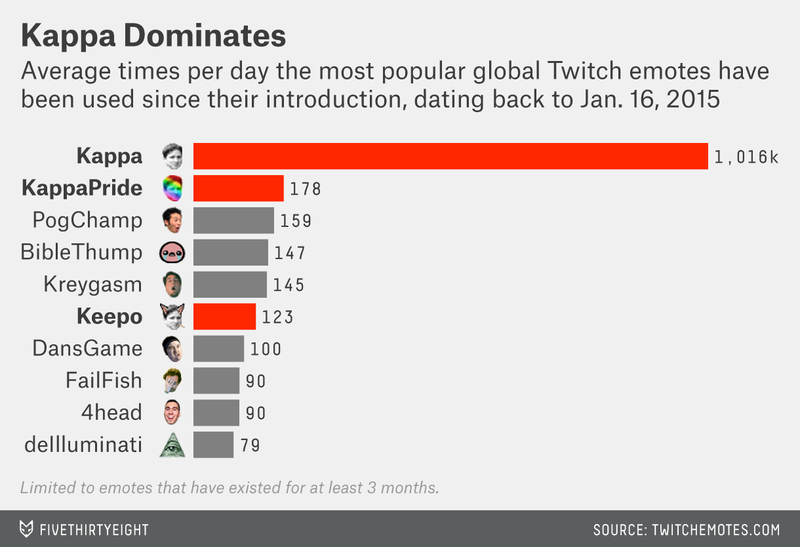 Based on the daily usage rates of the three Kappa-derived emotes in the available data set, they have been used more than 350 million times this year through Oct. 19. For example, Bill Moorier, former vice president of software development, created “RedCoat” to call up his face. Typing “OptimizePrime” calls up the face of Twitch CEO Emmett Shear. The whole mosaic is here.